Brain trauma can be one of the most challenging injuries to recognize and diagnose—and even more dificult to prove. In courtrooms throughout New York State and our nation, the attorneys at De Caro & Kaplen, LLP are often requested to explain the causes of traumatic brain injury and its lifelong consequences for our clients. In this complete guide to brain injury we will discuss everything you need to know about traumatic brain injuries, your rights, and where to get support if you or a family member has suffered from a TBI. If you are after specific information on traumatic brain injuries, you can use the quick links below. With its soft, jelly-like consistency, the human brain weighs about three pounds and floats in fluid inside of the skull. Despite being contained in a hard, protective barrier, this delicate organ is very vulnerable to injury. When the head and skull are struck by another object, it causes the brain within to scrape against the rough, hard interior surface of the skull. The force of the blow is transmitted to the brain after contact, causing bruising, bleeding, and even the destruction of nerve cells. The brain can also be injured when the head strikes a fixed object—for example, if a person falls and bangs their head on the floor. Beyond direct trauma, the brain can be damaged by the twisting or stretching of nerve cells and nerve fibers. 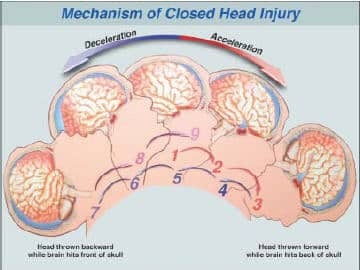 In car accidents, for example, the violent and sudden movement or turning of the head can cause damage to the nerve fibers, even without the brain striking or being struck by an object. Focal contusions: The result of the sliding impact of the brain within the skull. This brain injury is the most likely to cause cognitive problems and difficulties with emotional control. Skull fracture: A fracture results from major impact, and can lead to significant injuries including loss of smell and taste. Hypoxia and anoxia: The brain can be damaged as a result of a lack of oxygen, also known as hypoxic ischemia or anoxia. Frequently seen in drowning and strokes, following cardiac arrest, or in a birth injury when a baby is not promptly delivered. Brain bleeding/brain hemorrhage: This is usually the result of trauma, and can lead to seizure activity and traumatically induced epilepsy. Diffuse axonal injury (DAI): The result of rapid acceleration and deceleration of nerve fibers within the brain, which causes the individual nerve cells to stretch and tear. The brain is the command center for our entire nervous system and, in fact, our lives. You might think of the brain as the body’s air traffic control center. Everything we do—breathing, walking, talking, eating, sleeping, thinking, and our emotions—is controlled by one of our brain lobes. 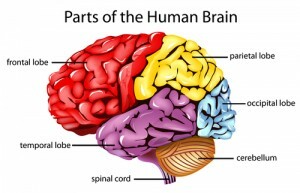 Since each lobe (frontal, temporal, parietal, and occipital) controls different functions, the types of symptoms depend on exactly what portion of the brain was injured. Some brain injuries cause memory loss or confusion. Others may cause difficulty with motor skills. Brain injuries affect each person differently, and no two are alike. Didn’t Lose Consciousness? You May Still Have Brain Damage. It’s a common misconception that traumatic brain injury is always associated with the victim being “knocked out.” This idea is false. It’s important to know that an individual does not need to be rendered unconscious to sustain brain damage. 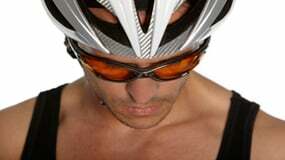 In fact, to the casual observer, a person who suffered brain trauma may appear just fine at the time of the injury. Symptoms of the trauma may be very subtle, and often don’t appear until days, weeks, or even months after the event. No matter what type of accident caused it, a traumatic brain injury can wreak serious havoc on your life. The symptoms can endure for months or even years, affecting everything from your capacity to work to your ability to maintain healthy relationships. At the New York personal injury law firm of De Caro & Kaplen, LLP, our attorneys understand the lifelong devastation that a traumatic brain injury can bring. In fact, our firm focuses its national practice on representing victims of brain trauma. If you suffered head injuries as a result of an accident, you may have a right to compensation. Contact us today to learn more. There are many others. If you or someone you know has experienced any new behavioral, memory, sleep, or motor skill symptoms after an accident, see a doctor immediately and contact us for legal help. Our book, Brain Injury: A Guide to Your Legal Rights, covers all aspects of brain injury, including signs and symptoms, communicating with your doctor, selecting legal representation, and financial planning options. Contact us today to get your complimentary copy. When you cut your arm, the signs of your injury—like blood and bandages—are clearly visible. A broken bone can be viewed on an x-ray, but a traumatic brain injury is different. On the surface, a person might look and act fairly normal. But on the inside, things are not working quite as they once did. 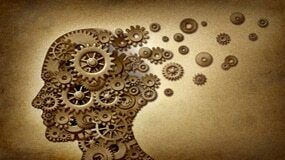 The victim may suddenly struggle with memory loss, difficulties concentrating, confusion, or impulsivity. He/she may be plagued with frequent headaches, changes in vision, sleep problems, dizziness, or difficulty with hand-eye coordination. Since many signs of brain injury are subtle, victims may not receive timely or appropriate diagnosis or treatment. Head injuries and resulting brain damage often go undetected and undiagnosed, even with the use of a CT scan or MRI study. Complicating matters even more is the fact that TBI symptoms may appear days, weeks, or months following an accident and the initial treatment received in a hospital emergency department. They were not “knocked out” at the scene of the accident. An individual need not be rendered unconscious in order to have sustained a concussion. They did not sustain any cuts, broken bones, or major physical injuries in the accident. There was not a “big car crash.” Even a low speed or low impact car crash can exert sufficient force on the brain to cause a traumatic brain injury. They are able to continue working, but if they are given a new responsibility, promoted, or transferred to another job, they may have great difficulty adjusting. They have a negative MRI, CT scan, or EEG. These tests are not sensitive enough to detect microscopic brain damage. They have a normal neurological exam. In truth, this exam does not reveal the neuropsychological deficits associated with traumatic brain injury. An injury to the brain has both cognitive components and physical components. While imaging techniques detect physical injury to the brain as a result of trauma, these tests do not asses the functional aspects of Traumatic Brain Injury or how the brain damage impacts upon the day to day functioning. The field of neuropsychology concerns itself with the study and evaluation of the functional aspects of the brain. It is concerned with the behavioral expression of brain dysfunction. The neuropsychologist uses a battery of tests to determine the patient’s attention, concentration, memory, planning and organization difficulties, speech and language deficits, and executive functioning (multi-tasking). The neuropsychological battery of tests will assist in the diagnosing of the cognitive, behavioral and intellectual deficits following traumatic brain injuries. These tests are standardized and have been administered over years to thousands of individuals. The results of the neuropsychological testing will be helpful in not only diagnosing the specific deficits and disabilities that an individual suffers from but also will aid in the management and planning of a brain injury rehabilitation plan. It is important to consult with a qualified neuropsychologist to determine what tests should be administered. While there are hundreds of neuropsychological tests available, there is no one test capable of assessing all functions of the brain. The ability to identify specific areas of brain dysfunction varies greatly among the available tests. Some tests are more specific and sensitive than others in identifying the specific traumatic brain injuries sustained. In order to be meaningful, neuropsychological tests must be both sensitive and specific in identifying the brain-based deficits The test must be reliable so that if the same test is given by different examiners at different times, the results will be consistent. There is an old adage in medicine that absence of proof is not proof of absence. This is particularly applicable to traumatic brain injuries which often cannot be detected by brain imaging technology. The failure to detect traumatic brain injuries using imaging technology does not mean that a traumatic brain injury did not occur. It only means that the technology is not sophisticated enough to detect the microscopic damage to nerve fibers or chemical changes to these nerve fibers that are the cause of the brain damage. An MRI is a high quality three dimensional image of the brain without the use of x rays or other forms of radiation. A patient usually lies in a hollow tube and is exposed to high powered magnetic fields. The atoms of the brain react to the magnetic charges and a computer creates a detailed image of the brain as a result. While an MRI is a powerful tool to detect structural changes to the brain, the magnets are not powerful enough to detect microscopic damage to brain fibers. Newer MRI technology has been developed, such as the Tesslor 3.0 MRI which is twice as powerful as traditional MRIs and allows a more detailed study of the brain. Brain damage is still undetected and stronger MRIs must be developed to detect all damage to the brain. PET measures the blood flow or energy consumption of the brain. Through this measurement, physicians are able to determine what areas of the brain are working and those areas that are not. Radioactive isotopes are introduced into the blood stream and are transported to different areas of the brain. The individual is asked to perform different tasks and measurements are taken in regard to determine how hard the brain is working. These measurements are converted by computers into three dimensional images of the brain and the various areas are colored to show the amount of energy used. PET SCAN technology has proved to be a very effective tool in detecting traumatic brain injury. This technology compares brain activity under both resting and activated conditions. It uses the technology of a traditional MRI and detects the increases in blood oxygen levels when brain activity brings fresh blood to different areas of the brain. Scientists are able to make a map of brain activities in healthy and brain damaged individuals using this technology. When a traumatic brain injury is severe—whether due to a car crash, slip and fall, or lack of oxygen to the brain—the victim can lapse into a coma. Too often, people in a coma-like state are misdiagnosed by medical professionals as to their real level of conscious awareness. If your spouse or other family member has an impaired level of consciousness following a negligence-related brain injury for qualified legal help. A coma is a prolonged state of unconsciousness in which a person’s eyes remain closed. Although the individual may appear to be sleeping, the brain of a comatose patient doesn’t exhibit the normal activity associated with sleep. What’s more, unlike a sleeping person, a coma patient cannot be awakened. In fact, they are totally unresponsive to external stimuli, such as voices, light, and touch. Not even pain will rouse them. Since nerve cells can regenerate, a coma may resolve itself within one to two weeks after a severe traumatic brain injury. How quickly a person emerges from a coma depends on how his/her brain injury was caused and its severity. 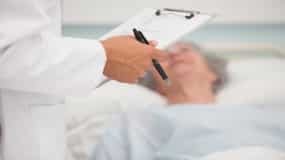 Generally, a patient who lapsed into a coma after a head injury will have a more promising outlook than one who became comatose following a heart attack. And younger patients usually fare better than older individuals. A patient may remain comatose if enough damage was sustained in an area of the brain responsible for wakefulness (such as the brain stem). In addition to coma, there are several other states of unconsciousness that can result from a traumatic brain injury. Brain death: Brain death is when all brain activity stops. It is irreversible, and typically the result of a severe or widespread injury to the brain. Vegetative state: Like a coma, a person in a vegetative state doesn’t respond to voices, smell, or touch or appear to comprehend language. But unlike a comatose individual, someone in a vegetative state does open their eyes, may make noises, and can go through a normal sleep/wake cycle. 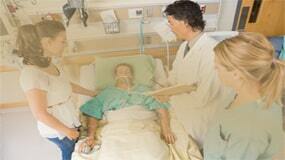 A vegetative state lasting more than 30 days is called a persistent vegetative state. If the patient remains in this condition for at least 12 months after a brain injury, their chances of recovery are very slim. Minimally conscious state: A person will often progress from the vegetative state to a low level of consciousness as they recover from TBI. A minimally conscious patient shows definite signs that they’re aware of themselves and their environment. They may respond to simple commands or show emotional responses to external stimuli—such as the voice of a loved one. Locked-in syndrome: Patients with this condition are awake and aware of what’s going on around them. However, due to complete paralysis of their body, they cannot move or communicate. In recent years, new imaging techniques have emerged to help doctors determine what state of consciousness a brain-damaged person is in. 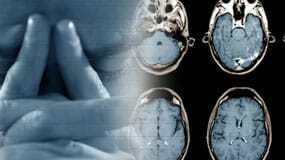 These include functional MRI (fMRI) and positron emission tomography (PET). If you or a family member has suffered a brain injury, having a qualified team of clinicians can help ensure accurate testing, which in turn leads to the most appropriate and humane treatment plan. By the same token, having a brain injury-savvy attorney on your side is vital to making sure you’re properly compensated for your suffering and loss. When a traumatic brain injury (TBI) occurs, the focus is usually on the victim—how they’re feeling, their symptoms, and their recovery. But TBI is a catastrophe that has a profound impact on the entire family, especially the victim’s spouse or partner. Life is typically never the same following a traumatic brain injury, and the changes that take place can make even the strongest marriage strain at the seams. Following are just some of the challenges you may face after your spouse or partner is diagnosed with TBI. Cognitive and emotional changes: In an instant, the person you were most deeply connected to can no longer communicate or comprehend the world around them in the same way. There may be short-term memory loss, depression, sexual disinterest, or inappropriate temper outbursts. You may feel like you’re suddenly married to a stranger. The burden of new responsibilities: If your spouse played a large part in household management, you might find yourself taking on a variety of new roles including primary breadwinner, money manager, main decision-maker for the family, and child care supervisor. Financial challenges: If your spouse contributed to the household income, he or she likely cannot return to work for some time, if at all. This may cause difficulty paying bills and feelings of remorse and/or resentment from you or your partner. Social isolation: While your spouse might see friends, family, and co-workers immediately following the injury, it’s typical for the flow of visitors to slow or stop as time goes on. Since your social life is probably intermingled with your spouse’s, you may also feel the pain of strained friendships and loneliness. Here are some practical suggestions to help you ease the adjustment following your loved one’s traumatic brain injury. Ask for help. You can’t do it all, and this is the time to rally family and friends around you. Don’t be afraid to ask others to lend a hand with tasks like laundry, banking, meal preparation, yard maintenance, and taking care of pets. Rely on those you trust for help with childcare and driving kids to and from school and activities. Join a TBI support group. A brain injury support group can be a valuable source of emotional support and information, and will allow you to connect with others facing the same struggles as you. A good place to start is finding the Brain Injury Association in your state. You might also consider ongoing or short-term counseling to help you adjust to the “new normal” brought on by your family member’s injury. Seek breaks. In-home healthcare assistance programs offer respite medical and brain injury services that can give you a break from daily caregiving. Many of these services are fully or partially covered by insurance. Take care of yourself. Being a good caregiver means caring for yourself as well. Be sure to get enough sleep and follow a healthy diet. Having energy and a positive outlook will enable you to play a productive role in your loved one’s TBI recovery. Traumatic brain injury (TBI) is a tragedy that does not discriminate. Virtually everyone—babies, children, and adult men and women of all ages, backgrounds, and levels of health—is at risk. Fortunately, a brain injury is not genetic or contagious. Often, it’s a preventable injury. You can protect yourself and your family from the devastation of TBI by taking simple precautions at home, at work, and at play. Did you suffer a preventable brain injury? Know your legal rights—talk to our experienced New York attorneys today. According to the CDC, in 2009, over 248,000 children age 19 or younger were treated in U.S. emergency rooms for concussion or TBI sustained in sports and recreational activities. Shana De Caro and Michael Kaplen, partners at the firm of De Caro & Kaplen, LLP, actively work with the Brain Injury Association of New York State and the Brain Injury Association of America on TBI prevention and education programs. These include community initiatives that provide helmets to children whose families can’t afford to buy them. Wear a seatbelt every time you drive or ride in a motor vehicle–even for short trips. Always buckle your child in a car seat, booster seat, or seat belt depending on what is appropriate for their height, weight, and age. Install window guards on upper-floor windows to keep young children from falling out. Use child safety gates at the top and bottom of stairs if young children are present in the home. Avoid having tripping hazards such as clutter and throw rugs in walkways (e.g. hallways). Ensure adequate lighting throughout your home. Make sure the surface beneath your child’s backyard play set is made of shock-absorbing material, such as wood mulch or sand. Never leave a young child unattended near a swimming pool. Install sensors on all doors leading from the house to the pool. Individuals who have sustained head trauma resulting in traumatic brain injury who are seeking personal injury legal assistance have many questions concerning their rights, insurance and medical issues and so do their families. The questions below and the responses provided have been prepared to address the concerns that victims of head injuries may have at the beginning of their case. If you need assistance concerning your head trauma case, please do not hesitate to contact us. We have prepared a free publication, Brain Injury, A Guide To Your Legal Rights that we will be pleased to mail to you. Please e mail us at Michael@brainlaw.com with your address to obtain this complimentary book. Please note that this information is not intended to be a substitute for legal advice. Always seek the advice of a qualified head injury lawyer before making any important decisions regarding your head trauma case. Review the answers to some common questions people have concerning head injuries and traumatic brain damage. Please contact us if you’d like to discuss any of these issues and/or if you are need of brain injury legal representation. One of the brain injury lawyers at the New York brain injury law firm of De Caro & Kaplen, LLP will return your call without delay. I cannot afford to hire a head injury lawyer. What should I do? You can hire a qualified, compassionate head injury lawyer to represent you without payment in advance. The attorney will wait until the end of the case to be compensated! In most states, including New York State, injured persons have the ability to retain an attorney by the use of what is commonly known as the contingent fee agreement. This means that the head injury attorney does not receive any fee or payment unless money is recovered on behalf of the person. If money is recovered, then the lawyer will receive an attorney fee based upon a percentage of the amount obtained. In reality, this means that the person with head trauma or their family members have the absolute ability to hire the best and most qualified lawyer. Do you only help accident victims in New York? We work directly with lawyers throughout the country and can assist you with out-of-state cases through our affiliations with other law firms. In addition to New York, our attorneys are admitted to practice law in Florida and the District of Columbia. Please contact us for more information. I have a head injury and am having problems communicating with my doctor. What should I do? Persons with head injuries are entitled to respectful treatment from their medical providers. Their doctor must understand the special problems that a person with head trauma must endure. When you schedule your first appointment, tell your doctor that you will require extra time. If distractions bother you, arrange for a quiet place to wait until the doctor can see you. Get to the appointment at least 15 minutes in advance so you can relax and unwind. Write down in advance everything that you want to tell your doctor. Write down every instruction the doctor gives you. Ask the doctor to write down your diagnosis and explain it to you and your family. Bring someone with you if you can, to make sure you understand everything. If you don’t understand, ask questions and ask for additional explanations. Can I develop a seizure disorder or epilepsy as a result of an accident or head trauma? It is well known to the medical and legal community that one of the most frequent causes of a seizure disorder or epilepsy is traumatic brain injury. It doesn’t matter whether the initial head trauma was mild, moderate, or severe. A seizure is an electrical explosion in the brain. All brain activity is controlled by electrical impulses caused by the individual nerves firing charges that pass from one nerve cell to the next. When a seizure occurs, the nerve cells do not fire properly and instead fire with sudden, short, and intense energy. Epilepsy is simply more than one seizure. Epilepsy is the name given to the condition of multiple seizures. How long after an accident in which I injured my head can seizures or epilepsy develop? A seizure disorder or epilepsy can develop any time following an accident or head trauma. Seizures may develop immediately after the traumatic brain injury and are called immediate seizures. If they develop within the first 24 hours following the head trauma they are called early onset seizures. The seizures may develop days or even weeks after the accident. These seizures are called late seizures. A seizure disorder can even develop after the first year following a brain trauma! Seizures come in all shapes and sizes. Although a seizure disorder will always start in a specific part of the brain it may or may not spread to other areas. a. What is a generalized seizure? When a seizure starts in one area of the brain and then spreads to other areas, it is called a generalized seizure also known as a grand mal seizure. We are all familiar with this type of seizure, which generally results in a violent shaking of the arms, legs, head, and neck. This is referred to as a convulsion. A person can have a generalized seizure without a convulsion. In these cases, the person will have just a blank look and will appear to be staring off into space. The person is disconnected from everything around them and is unaware of what is going on during this period of time. b. What is a partial seizure? In a partial seizure disorder, only a small part of the brain is affected. The seizure or electrical activity remains confined to one area of the brain and does not spread to other parts. The person may be conscious or unconscious during the seizure. The seizure may or may not involve shaking. The experience depends on where the electrical firing inside the brain took place. Frequently the only thing the person notices is an altered sense of taste or smell just before the seizure takes place, a feeling or fear of uncontrollable outbursts or crying or a feeling of being in a different place. The seizure may cause awakening the same time every night from a deep sleep, bed wetting, and a twitching of the face, arm, hand, or leg. The feeling may even be a strange sensation of numbness, tingling, or hearing of unusual sounds or voices. How is a seizure or epilepsy diagnosed? An electroencephalogram (EEG) is a device frequently used when a person is suspected of having a seizure disorder or epilepsy. The device is designed to measure the electrical activity in the brain. BUT, because the electrical firing that causes the seizures may not be occurring when the EEG is taken, the results are often normal, even though the person has a seizure disorder or epilepsy. In many instances when an EEG is normal, a doctor who wants to confirm the seizure disorder, may order a 24 hour continuous EEG and constantly monitor the activity of the brain over this longer period of time. Even then the person may still have normal readings but still have a seizure disorder. Sometimes, a video tape is also made of the person so the doctor can correlate what they see with the EEG. Many times, the only way to diagnose epilepsy and seizures is by careful and detailed questioning of the individual suspected of having this neurological condition as well as questioning their close friends and family members. Too often, people who have sustained brain damage in preventable accidents are not fairly compensated for their injuries. This is because their attorney didn’t have sufficient knowledge, understanding and experience with either this condition or its causes. 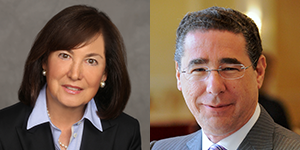 Our partners, Shana De Caro & Michael Kaplen, have dedicated their careers to advocating for victims of brain trauma. They understand that no two injuries are alike, and that even mild cases of TBI may have lifelong consequences for the affected person and those they love. Together, Shana and Michael will fight hard to ensure the parties responsible for your brain injury answer for their wrongdoings. Our goal is to obtain maximum compensation to help you advance your recovery and restore your quality of life. Contact us today. This guide was co-authored by Shana De Caro & Michael V. Kaplen. 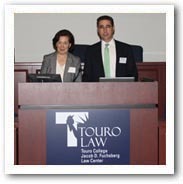 Shana De Caro and Michael V. Kaplen have each chaired the Traumatic Brain Injury Litigation Group of the American Association of Justice, have co-authored the outside counsel column in the New York Law Journal, “Traumatic Brain Injury: Detecting, Defining, Litigating” and are members of the Board of Directors of the New York State Academy of Trial Lawyers. Shana De Caro is secretary and member of the Board of Directors of the Brain Injury Association of America. Michael V. Kaplen chairs the New York State Traumatic Brain Injury Services Coordinating Council and is past president of the Brain Injury Association of New York State.